What's your favourite feature in the G&W Magazine? We are always looking for handball and rounders news … have you got any? Limerick hurlers enter the new season as All-Ireland Senior champions for the first time in almost half a century. Isn’t it wonderful to read that opening sentence? Memories of years of frustration and disappointment have been washed away by the achievements of John Kiely’s team. The new season saw Limerick carry on where they had left off with hard-fought victories over Wexford, Tipperary and Killkenny in the Allianz National Hurling League. There is a long road ahead that could have many twists and turns but Limerick followers know that this team will not be found wanting for determination or effort and we cannot ask for any more than that. 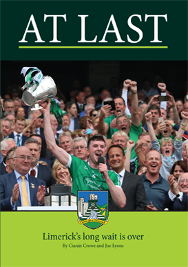 Limerick GAA County Board decreed last September that the Liam McCarthy Cup would be brought to as many schools as possible and that is exactly what has happened over the past two school terms. 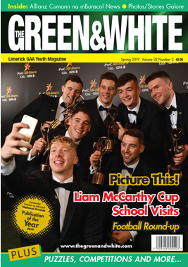 In this issue, we feature many of the photos that were submitted to us by teachers from schools in all parts of Limerick. As a new year and a new playing season arrived, one of Limerick hurling’s greatest servants departed the intercounty scene. Séamus Hickey announced his retirement after 13 seasons in the Limerick colours at senior level. Séamus was there for the worst of times and the best of times but his commitment never wavered. We salute one of the true heroes of Limerick hurling herein. So far, the 2018-2019 Allianz Cumann na mBunscol season has seen County football titles won by Scoil an Spioraid Naoimh, Roxborough and Monaleen NS. West Limerick completed the Divisonal Double winning both the Sarsfield Cup and Larkin Shield. The coming months in the Allianz Cumann na mBunscol leagues are full of promise. Indoor hurling and camogie tournaments are already underway in all four Divisions and the INTO Mini Sevens competitions and the much-loved school hurling and camogie leagues will soon follow. Without a doubt, featuring in many of those games will be the Limerick players of the future.